My little guy (who is 9 months tomorrow) didn't pass his first round of swimming lessons, which isn't all that surprising, given that he doesn't know what his legs are, so flutter kick is pretty much out. And he's not a huge fan of being dunked under the water, but that didn't keep me from being a little sad for him when he got his report card sans badge. So what's a crafty-swimming mama to do? Make a badge of course! And so, my little guy got his Master of the Inchworm Kick badge, because it really is ingenious, this kick he's worked out! A wild percussion in the wind. 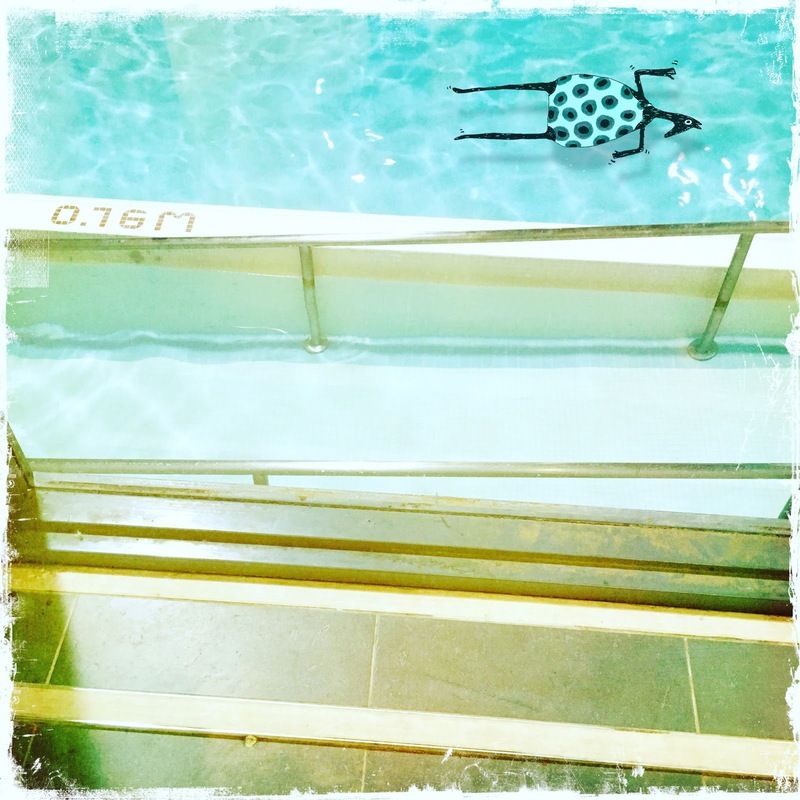 Inside the pool swelled then sighed. A caged ocean of arctic blue. A swift decent into heaven. I swam there for 50 minutes. And floating out to sea under a wood lined sky. *Based on a Sunday swim at the Lindsay Recreation Complex, known to the locals as the Aquartorium. It was an A+ pool! It turns out my antidote to not being able to swim outdoors for more than half the year isn't swimming indoors. It turns out, it's writing a novel about a lifeguard named Bea who stands on the edge of Lake Ontario and swims every day at lunch. One afternoon in September, I left my little guy with his first babysitter and spent hours (!) on the beach, staring at the lake, writing about the lake, wishing I was swimming in the lake with Bea. I take the ladder, rungs slippery with algae. From the sand, the lake looks blue, but at eye level, it’s a thick, dense green. I adjust my goggles and push off. I trace a keyhole underwater and kick hard, the muted thump of my feet against the surface. Emily is a strong swimmer and I have to work to keep up. We swim along the cordoned off area, the blue and white rope slimy with algae, and turn around at the final buoy to head back the other way. Lake swimming is so much different than swimming in a pool. Here, waves are sporadic and catch you off guard, tripping up your arm, making you misjudge how far you have to turn your head for your next breath. Here, the water gets in your nose so you taste the lake, even if you’re careful not to swallow any water. I wonder how different it would be if this was the ocean -- if the waves were governed by tides and undertows instead of winds and boats. I’ve never swam in an ocean before and wonder if the salt really does make you buoyant. I blink through the water leaking into my goggles, Emily’s legs glowing to my right and as we swim back and forth and back and forth, I realize how much I’ve missed this -- the rhythmic quiet, where the only thing filling my ears is the push of water. I knew it would only be a matter of time before we three water loving creative spirits, found ourselves entangled in a swim related crafting challenge! Our first aquatic call to action–Swim Inspired CROWNS! It began when my “birthday” swim was foiled by a very spotty case of Roseola applied on one very fiery toddler. So no lunchtime swim for this lady, instead I stayed home from work to take care of my rash and fever ridden kid, while watching Annie, and eating Mac N’Cheese on the couch. Rash and fever aside, that’s a pretty fun day in my opinion! Ha! But I was a little bummed about missing that swim window… so I thought maybe to cheer myself up, I could make myself a birthday crown, all about swimming! So out came the craft paper, scissors and tape! And from the flurry of snips, clips and aqua colored paper fluttering about the living room… emerged my pièce de résistance! An ode to swimming laps in my favorite red bathing suit! I sent the image to my fellow swimmers and challenged them to each make their own. And the results were OUTSTANDING! Laura and Lindsay of course, both knocked it out of the pool with their crowns. Lindsay made a fabulous and nostalgia inducing swim badge inspired crown! And Laura’s created an outstanding work of swim art, with layers of waves and swimmers towering above her head! So I’m going to call our first Swim Crafting Challenge (which I hope will be one of many more to come,) a resounding success! Now it’s your turn! I’ve sketched up some quick and simple instructions on how you can make your own swim crown! Really the whole idea is to have fun and meditate a little on why you love to swim yourself… and then create a crown to celebrate those buoyant thoughts! Last request… share them with us! We would love to see what you make! How To Make Your Own Swim Crown... in three easy steps! *Main rule... have fun and make some waves! Clockwise: Rhya's flip turn badge, Patrice's nightswimming badge, Laura's roadtrip-to-swimming-hole badge and my remembering-to-pack-post-swim-snacks (namely swim biscuits) badge. I can still remember the last day of swimming lessons, where, after we finished the final game of frozen tag in the shallow end, Jennifer or Rebecca or Mark or Andrew would hand me my report card, towel wrapped around my shoulders, my mom waiting on the other side of the fence. I can still see the blue-ish photocopy of the girl swimming on the front of the Canadian Red Cross report card. But even before opening it up to the the checkmarked boxes, or the empty boxes (damn treading water! ), there was the thickness of the report card. If there was a badge stapled to the inside, you passed! Onto the next colour! But if it was thin, no dice. But badges! Rhya mentioned badges the other day on our months-long swimmers text thread and I literally dropped everything and started stitching. Flip turns? TOTALLY A BADGE! Nightswimming in the nearby river? BADGE! Driving, finding a different swimming hole, missing ice cream, the finding the right swimming hole? BAAAAAADGE! And my own humble badge, celebrating when I remember to pack a post-swim snack so I don't turn into a monster on the bike ride home. But it's no fun to just have one badge to sew to your bathing suit! So I made docktail/rocktail badges too! Clockwise: Caesers, Dark and Stormys, Aperol Spritz and a classic gin and tonic. It is still dark out on this strangely warm November morning, but I've downed a pot of coffee and watched my little guy practice his crawl (his on-land crawl is the same as his swim-crawl these days!) 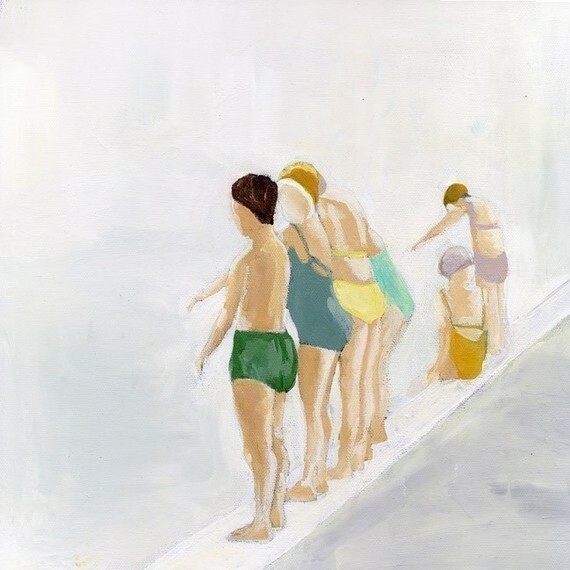 and have fallen in love with the swimming art by Portland artist, Lisa Golightly. 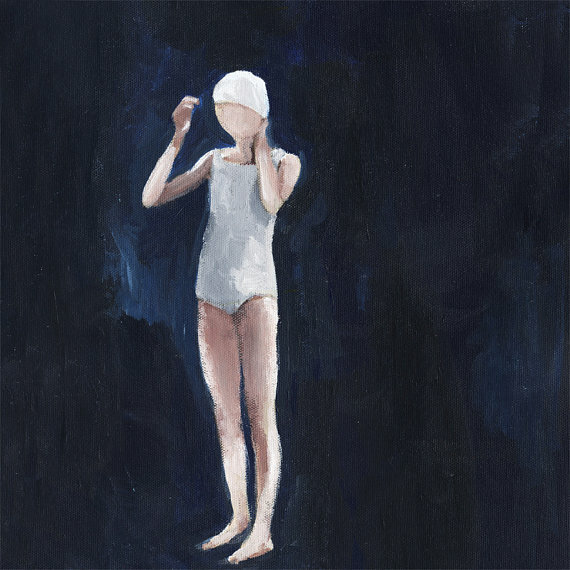 The postures and slight awkwardness of standing poolside in a bathing suit are so perfectly captured. 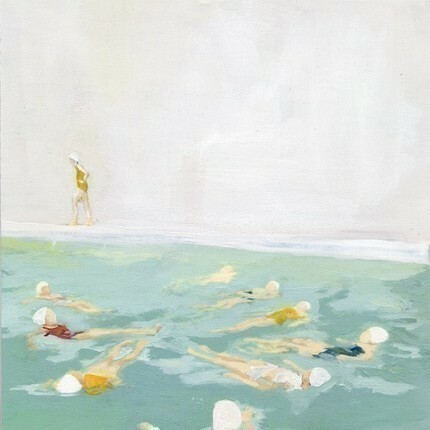 Every piece feels like a hazy memory of my childhood swimming lessons on the deck of Parklawn Pool. There are so many incredible pieces at her shop, Kiki and Polly, I might just have to make another pot of coffee and keep pouring through them.